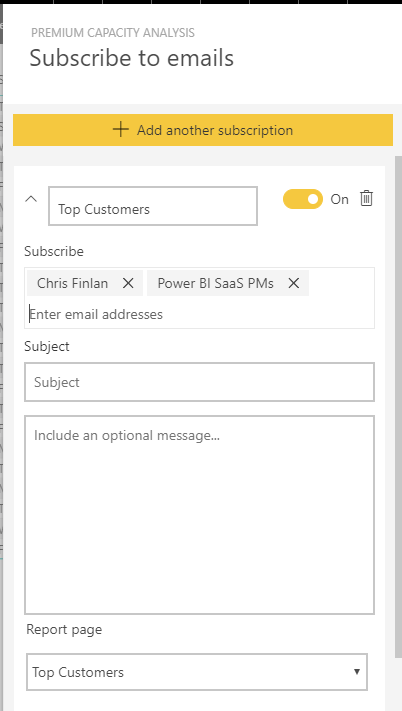 Today, we’re pleased to announce we’ve added the ability to subscribe other users to e-mail subscriptions you setup for reports and dashboards in PowerBI.com. This highly requested feature allows Pro users to subscribe other Pro users. Additionally, if the content is in a Premium workspace, Pro users can subscribe any users, security groups, or distribution lists regardless of whether the recipient is a Pro user or not. 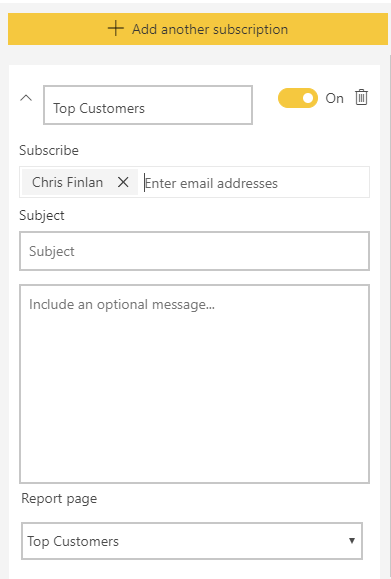 Once you’ve added these other users to either your existing or new subscriptions, Power BI will now send the same screenshots of your report page directly to your inbox whenever the data changes. 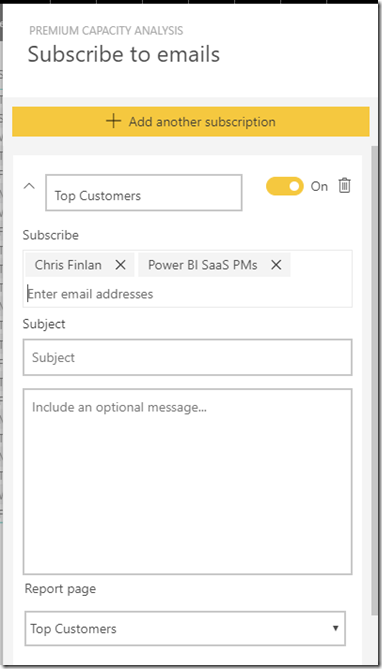 The image in your inbox will show up exactly as it does in Power BI, and include a link to the report where you or anyone you’ve subscribed can dig into the details. It’s an easy way to expand visibility to anyone in your organization for the reports that matter most to them. Ready to take the next step with your email subscriptions? It’s largely the same process you’d follow previously to subscribe yourself, so it’s easy to get started. Let’s subscribe some other folks to my favorite report. First, open the report that you want to subscribe other users, and click the “Subscribe” button. In the subscriptions pane that appears, select the report page that you want to subscribe to. You’ll notice some new options have been added you can fill out, including a “Subscribe” field. By default, your name will be populated here. Since my report is in a workspace hosted on Premium Capacity, I can subscribe a group of users in my organization to the report. I can also add a mail subject and optional message for my subscription to give users additional details about the mail they’re receiving. They’ll generally receive the email once every day when the data is refreshed. However, data refresh settings can impact frequency. For full details, see the documentation. Once you’re finished with the subscription, select “Save and close” at the bottom the subscriptions pane to confirm the subscription. That's it! 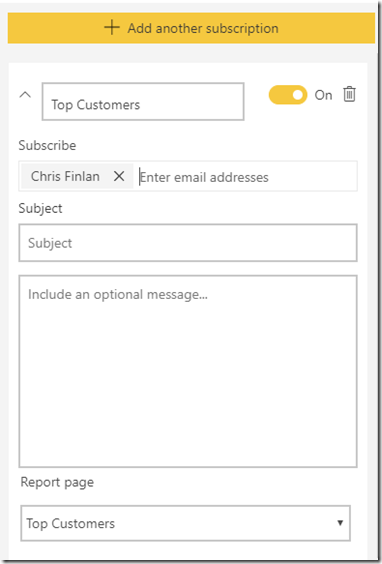 The next time the data is refreshed, Power BI will send an email to the addresses you added. Tip: Want to see if users get the email right away? Trigger a refresh by going to the dataset, and then click the “Refresh now” option. If you don’t have edit permissions to the dataset, you may have to ask someone who has those permissions to do this for you. We have a lot more on tap for this feature in the coming months, including additional options around scheduling and attachments. Stay tuned to the Power BI blog for more details!